As smartphones get smarter and computers compute faster, researchers actively search for ways to speed up the processing of information. Now, scientists at Princeton University have made a step forward in developing a new class of materials that could be used in future technologies. They have discovered a new quantum effect that enables electrons -- the negative-charge-carrying particles that make today's electronic devices possible -- to dash through the interior of these materials with very little resistance. The speeds achieved by these electrons have led to comparisons to another novel electronic material, graphene. The new class of materials has the potential to be superior to graphene in some aspects, Hasan said, because graphene is a single layer of atoms in which electrons can flow only in two dimensions. 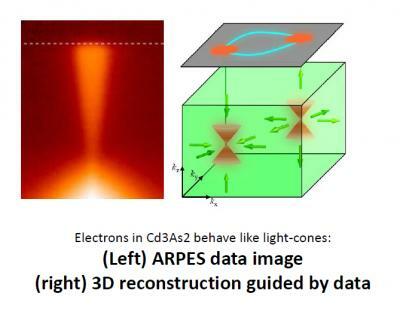 Cadmium arsenide permits electrons to flow in three dimensions. The new study redefines what it means to be a topological material, according to Su-Yang Xu, a graduate student in Hasan's lab and co-first author of the May 7 paper with postdoctoral research associate Madhab Neupane at Princeton and Raman Sankar of National Taiwan University. "The Princeton group showed in exquisite details that electrons in certain solids obey the three- dimensional massless Dirac equation," said Patrick Lee, a professor of physics at the Massachusetts Institute of Technology who was not involved in the work. "While predicted by theoretical calculations, this behavior has never been seen before in real materials until this past year. This work adds greatly to the ongoing excitement of how topology can impact electronic states in real materials."